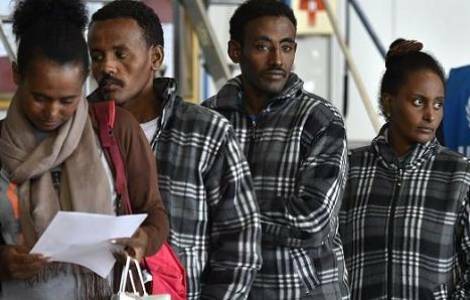 Asmara (Agenzia Fides) – People still flee from Eritrea. The official end of the war with Ethiopia has not stopped the exodus. Boys and girls run away from an oppressive regime and from a very poor society that does not offer job opportunities. Abba Mussie Zerai, a priest of the eparchy of Asmara, wrote an open letter in which he criticizes the ruling class of his Country, asking to keep the attention alive: "The regime in Asmara – he says in the letter sent to Fides - is one of the world's toughest political regime, a dictatorship that suppressed all forms of liberty, annulled the 1997 constitution, suppressed the magistracy, militarized the entire population. A dictatorship that, in a word, has created a State-prison. The numerous, detailed reports published by various international institutions and organizations and by the most prestigious NGOs and humanitarian associations have denounced this situation for twenty years. Also the two final reports of the investigations conducted by the UN Commission on Human Rights, clearly states that the regime has elected terror, making its own people slaves. Not surprisingly, in the 2016 report, we come to the conclusion that there are well-founded elements to refer the main leaders of the Government to the International Criminal Court". Many Eritreans die during the journey. The accident that symbolizes this tragedy is the shipwreck that took place on October 3, 2013, when more than 300 people died. "As Eritrean - observes Abba Mussie - I ask to bring the bodies of the victims of the massacre Lampedusa back to Eritrea and of all the other young refugees who drowned in the Mediterranean and are buried in Italy. It is time to overcome controversies, in the name of a human principle of great significance: to give families a place to pray for their loved ones".